In this photo provided by South Korea Unification Ministry, South Korean Red Cross President Park Kyung-seo, left, shakes hands with his North Korean counterpart Pak Yong Il during a meeting at Diamond Mountain resort in North Korea, Friday, June 22, 2018. 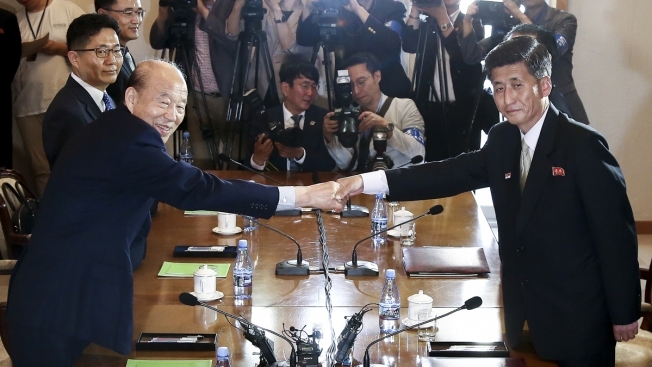 North and South Korean officials met Friday for talks on resuming reunions of families divided by the 1950-53 Korean War as the rivals boost reconciliation amid a diplomatic push to resolve the North Korean nuclear crisis. 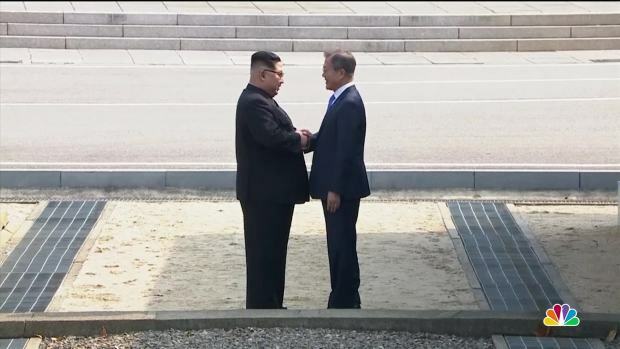 North and South Korea agreed Friday to hold temporary reunions of families divided by the 1950-53 Korean War as they boost reconciliation efforts amid a diplomatic push to resolve the North Korean nuclear crisis. The reunions will take place at North Korea's Diamond Mountain resort from Aug. 20 to 26, Seoul's Unification Ministry said after a nine-hour meeting between officials from the two sides. Friday's talks between Red Cross officials from the countries at the Diamond Mountain resort were to arrange details of the reunions. "If we sternly separate ourselves from the unfortunate past and acquire a strong mindset for the new times, humanitarian cooperation between the North and South will flourish," North Korea delegate Pak Yong Il said at the start of the meeting. Park Kyung-seo, South Korea's Red Cross chief, expressed hope for talks that could "resolve the grief of our nation." Aside from setting up a new round of reunions, South Korean officials had hoped to discuss plans for a survey to confirm surviving members of war-separated families in North Korea and the possibility of hometown visits and exchanges of letters. It wasn't immediately clear whether they were discussed during the meeting. Seoul has said the 12 women, who had worked at a restaurant in China, had defected and willingly settled in South Korea in 2016 but is now reviewing the circumstances following a media report suggesting at least some were brought against their will. It wasn't immediately clear whether North Korea raised the issue during Friday's meeting. The North rejected a South Korean proposal for family reunions last year, seeking the workers' return first.